The majority of workstation improvements often involve modifying employee behaviors not purchasing expensive workstation equipment. We will evaluate workstation design and layout, identify potential risk factors, instruct individuals on proper use of workstation components and provide stretching and strengthening exercises. Designed for management and / or employees. We offer general awareness training designed for all employees or more comprehensive programs specifically designed for management / ergonomic task force members. Training includes recommended working postures, signs and symptoms of musculoskeletal disorders (MSDs), ergonomic risk factors, selecting and arranging workstation components, specific exercises to recover from or prevent MSDs. 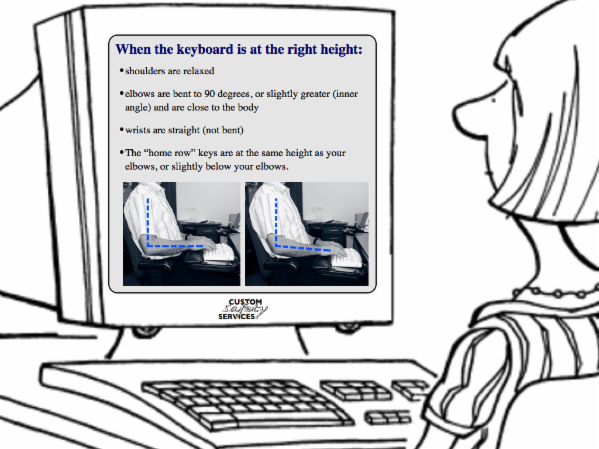 Creating an internal task force to tackle your office ergonomic exposures can be very complex. Successful programs include the ability to recognize the early warning signs, open communication channels and equipment purchasing guidelines. We will work with your management team to get your task force trained and educated at completing individual workstation evaluations and the ability to recommend cost effective solutions. We have worked with various insurance carriers to provide independent evaluations of workstations for employees experiencing carpal tunnel syndrome or other repetitive strain injuries related to computer use.